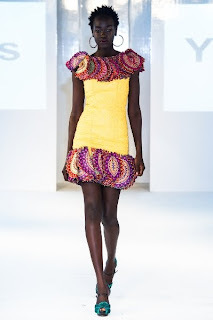 I was lucky enough to stumble across my first live catwalk show, in Spitalfields Market during African Fashion Week. I must confess to being a sucker for the glamour and frivolity of fashion, though I find it hard to take it too seriously and can't quite understand why it's fashionable for all models to look like they are angry with the clothes they are wearing! I do love the mix of vibrant African fabrics set off by plainer colours though. Photo credit to Catwalk Capture.